A couple weeks ago we discovered Playfoam for kids from Educational Insights. It has proven to be a high reward toy that our toddler just loves to play with. Playfoam is a newer toy I had not encountered before, so I'm going to line Playfoam up against the widely successful Playdoh product that shares the same sculpting materials toy category. Playfoam or Play Foam and Playdoh both come in a range of bright colors that are attractive to kids and stimulate thier imaginations. The bigger the package you buy the more colors you get to play with. Playfoam comes in brick shaped solid color blocks while Playdoh comes in sealed cans of a single color. Playfoam also is available in glow in the dark and sparkly versions. 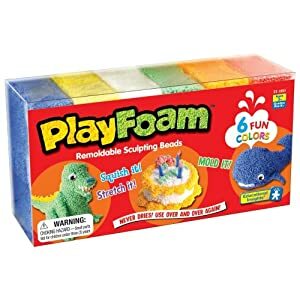 While Playdoh is made from flour, salt and water along with other agents, PlayFoam appears to be made from expanded styrofoam with coloring and an unusual sticky substance. This magical sticky covering causes the foam to stick to other pieces of foam quite well but not to really stick to hands, clothing, floors and other surfaces. Sure it sticks a little to everything, but it comes off easily. Both products are advertised as safe for ages 3 and up. Our girl kept forgetting to close the Playdoh containers and we had to throw out the hardened chunks. The fact Playdoh hardens when exposed to air makes it great for creating permanent sculptures and Christmas ornaments but it makes it hard to reuse when kids forget to close the container. Much cooler, we found that Playfoam does not dry out like Playdoh does. Play foam can be stored in an open container without any issue indefinately. Clean up is also easier with Playfoam. It does break apart easily but it can be used to pickup other pieces of foam. Just make a ball and start dabbing up all the loose pieces. Playduh tends to crumble and spread out all over, working its way into carpet, hair, and sticking to hard floors. Kids can build all kinds of colorful shapes with both toys. Playdoh can be mixed fairly easily with some effort, but our girl proved Playfoam can quickly be fully mixed into a colorful rainbow shade to model with. PlayFoam can be used at school, at home, and we could see it being used in a birthday party setting because it can be pulled apart and shared easily. In our opinion Playfoam is a great investment because it offers unlimited creative play for years. Easy for little kids to use but as your child gets bigger she can build more complex sculptures and add in accessories. We've had a hard time finding more PlayFoam in the stores (we bought the first batch at Walmart) but then we found a wide selection of Playfoam kits at Amazon. 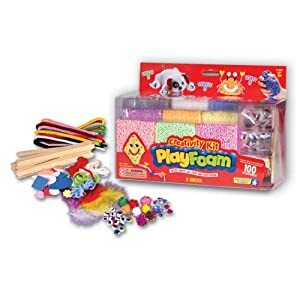 In a time when we need to carefully select toys that provide good value and are safe for our kids, Playfoam remoldable sculpting beads are a pretty good choice. Interesting. I'll have to check this out. I'm a big play Playdoh fan but I tried Moon Sand hoping to avoid dry Playdoh. I found that to be a big mess to clean up so perhaps PlayFoam is a good option. Thanks for the tip. Yes, Playfoam is not very messy. Even when we find it in the couch we just scoop it up and put it back in the bucket. The occasional little bits get vacuumed up without a problem. Playfoam sounds like a better option than playdoh because you have explained the benefits so well. I have never heard of this. Might have to buy one of these packs for my nieces for Christmas! It does spread around the house a little if your kids don't put it back in the container properly, but not too messy.